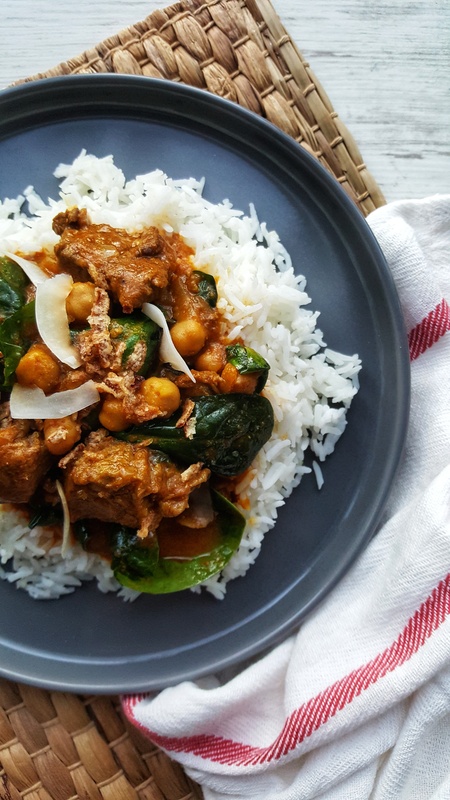 This is a mild Beef, Spinach & Chickpea curry with almost a rich tagine or stew like flavour!! To ensure your beef is fully tender, the cook time is a little long but it will be worth the wait. Your curry sauce will also reduce down to a rich delicious broth. I can promise you an utterly delicious, comforting and lick the bowl clean curry recipe awaits you …. yes, I regularly lick a bowl, plate or dish clean after such a feast!! Lamb would be great instead of beef or for a veggie option simply substitute with butternut squash or any type of potato. If using squash or potato the cook time will be at least halved. Heat the oil in a large saucepan over a medium heat. Add the onions, garlic and chilli and cook until soft through. Stir through the spices and tomato paste. Add the bay leaves, coconut milk and stock. Stir and allow to simmer over a low heat. Get two sheets of greaseproof paper. Place a third of the beef between the sheets and flatten with a rolling pin or wooden spoon. Remove and repeat with the remaining beef. Mix the flour, salt and pepper with the beef until well coated. Heat a non-stick dry frying pan over a medium heat. Add the beef in batches, browning on all sides and adding to the curry base. Repeat with remaining beef. Bring the saucepan to a boil, cover and return to a simmer. Allow the beef to cook for 90 minutes or until cooked fully and tender through. Make sure to stir the contents regularly to ensure they don’t stick and burn to the base of your saucepan. Just before serving, stir through the chickpeas and spinach until the spinach is wilted and chickpeas are warm through. Serve with a dollop of natural yoghurt, coconut flakes and crispy shallots.